Strictly Country Records announce their spring releases: the new CD Rollin' along: live in Holland by Jonathan Edwards, with twenty tracks; and The storm by Liz Meyer, accompanied by Bela Fleck, Jerry Douglas, Sam Bush, Emmylou Harris, Stuart Duncan, Ron Block, Rob Ickes, Glen Duncan, Byron House, Kenny Malone, Mark Johnson, and Shad Cobb. Both albums can be sampled on CD Baby. Please contact SCR by e-mail to buy direct from the label, or for DJ and press copies. Strictly Country Records is a major supporter of the EWOB Festival. On 1 May he begins a three-week tour of Britain and Ireland, where he will return in late June for a further three weeks. Full tour details are on his website and MySpace site. The concert program and workshop schedule for the European World of Bluegrass Festival 2009 - the 12th annual EWOB Festival - are online now! We have a wonderful lineup of artists from the USA, Canada, and all over Europe that you won't want to miss. The EWOB Festival takes place as always in Voorthuizen, the Netherlands - this year on Thursday-Friday-Saturday, May 21-22-23. If you haven't visited the new EWOB Festival website, drop in ASAP! You can hear audio clips from all 48 tracks of the 10 YEARS OF EWOB double CD, read all about our unique event, and fall in love with European bluegrass. Please sign our Guestbook! European promoters: We have 42 great bands in Holland in late May, both American and European, many of whom are available and looking for any extra work in the dates around the EWOB Festival. If you can offer a job to a good bluegrass band, duo, etc., please contact us right away. It's an excellent opportunity for you to hire musicians who normally live too far away. Perhaps there are some folks who would like music for a private party or event - don't miss the chance to invite someone really special! If you are located far from Holland, you can look for bands that might be traveling near you on their way to or from the EWOB Festival. You can see where the artists are from and visit their websites by clicking their names in the EWOB Festival 2009 program. From Vyborg to L.A. (Goofin´ Records GRCD 6156), the latest album by Finland's hard-driving, uncompromising band Jussi Syren & the Groundbreakers is out now. Jussi Syren & the Groundbreakers are among the hardest working bluegrass groups outside the US, with an impressive touring schedule (throughout Europe and nine US states) and a catalogue of recordings which have got airplay in over twenty countries. In Finland they have taken bluegrass into mainstream: prime-time TV shows, music charts, rock festivals, and night clubs. From Vyborg to L.A. features the songwriting of Jussi Syren himself and of Thomas Blom from Sweden, whose material has been recorded by such prominent American artists as Kenny and Amanda Smith. For the album, the Groundbreakers invited special guests Kukka Lehto (fiddle) and Marko Vanhatalo (dobro). Jussi's daughter Veera sings harmonies on 'The ghost of Laura Wilkins'. The liner notes are written by Alan Bibey. Sound clips can be heard on the band's website and MySpace. As recently announced on the EBB, Kevin Lynch of Connecticut, USA, has taken up residence in the Netherlands, bringing with him an encyclopedic knowledge of bluegrass music and over thirty years' experience in practically every field of bluegrass activity, including as a professional performing and recording artist on mandolin and guitar. In the USA Kevin was a founding member of Traver Hollow, who recorded an album Live in Holland (SCR-16) for Strictly Country Records. He played at the first EWOB Festival in 1998 with Amy Gallatin & Stillwaters, and has since been mandolin player and harmony singer with TrueGrass. He also hosted a weekly radio show, 'U-H Radio Bluegrass', on WWUH 91.3 FM in West Hartford, CT; produced or co-produced music festivals and concerts; and has been a director of the Connecticut Bluegrass Music Association (CTBMA), and a charter member of the IBMA. At recent EWOB Festivals at Voorthuizen (NL), Kevin has been a valued part of the sound and stage crew and Mandolin Workshop presenter (again in 2009 as well). His residence in Europe is a welcome addition to the scene here. He can be contacted at +32 172 411676 or by e-mail. The love of horses, the joy of collecting and restoring old tractors, the desire to produce better crops and animals, the love for traditional country music, the excitement of competition, the commitment to leave this earth in better shape than when you arrived, are all international bonds. Rural people have more in common than they are different. Regular features include the Kentucky-focused 'Bluegrass & backroads', showings of the classic 'Hee Haw' series and the Porter Wagoner and Wilburn Brothers Shows, guest appearances by such artists as Rhonda Vincent & the Rage, and the Cumberland Highlanders (above). All our dates, which I constantly update, can be viewed at this link on our website. Besides details such as addresses, phone numbers, and playing times, there are usually links on the individual dates (just click the underlined entries) to the stages or events. We hope to see you at a Matching Ties or Paul Stowe concert soon. Promoters: please feel free to contact us anytime if you are interested in booking us, especially if we play in your area, as connector bookings are always desired. *The full newsletter in German, English, and Italian, with concert dates for every configuration of Matching Ties - as well as Paul's solo dates in the US later in the year and a link for buying Matching Ties CDs (including their latest, Across the sea - can be read here. Further dates may be arranged. Thanks to the Friends Of American Old-Time Music And Dance (UK) for the news. 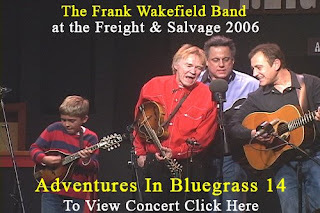 Jim Moss's online Bluegrass Newsletter for March 2009 is now available, including film of a show by the Frank Wakefield Band (above) at the Freight & Salvage venue in California, with guest artist Marty Varner (above, left). The newsletter also includes photos, interviews, and other material relating to Bill Monroe, Lester Flatt, Ralph Stanley, Jimmy Martin, Jesse McReynolds, and other great figures in bluegrass, not to mention many of the musicians and others who knew them; together with access to Jim Moss's own bluegrass fiddle website. This and further issues can be received FREE. BLUEGRASS EUROPE, EBMA's official magazine, is proud to announce that Kevin Lynch, well-known mandolin player and freelance writer who now resides in the Netherlands, will review the latest, major project on guitar giant Clarence White in the June/July issue. His in-depth article will feature very rare photos and references to European tours of the past. Contact Kevin at KLbgrass @ aol.com. (press release) Roland White & Diane Bouska have released an impressive 102-page book and 2-CD set presenting the legendary Clarence White’s flatpicking acoustic guitar style. The book includes transcripts in notation and tab format to 14 tunes (a wonderful cooperative effort by Matt Flinner, Steve Pottier and Diane Bouska). You also get detailed and easy-to-follow instructional text by Bouska, a personal and extensive biography by brother Roland, a large collection of photos (some previously unpublished), a heartfelt ‘Foreword’ written for the book by Marty Stuart and much more. CD-1 features Clarence playing all 14 tunes in the book on his Martin D-18 guitar. These are home recordings made in 1962 by Clarence for his guitar students. These cuts contain only Clarence’s lead playing and one rhythm guitar. CD-2 features basic rhythm tracks of the 14 tunes in the book by Roland White (rhythm guitar) and Missy Raines (bass). This allows you to practice your playing as you work your way through the book. There are instructions for a free software tool to adjust the speed of the tracks to your comfort level. This disc also includes CD-ROM video of Clarence -- complete with close-up views of his hands in action as he plays two songs from the book/CD. Plus a lengthy slide-show of amazing photos (including The Country Boys and Kentucky Colonels bands). A fine retrospective of Clarence’s life & career in bluegrass music and a great treasure for all Clarence White fans, listeners and musicians alike. Information is available at www.rolandwhite.com. On Saturday 14 March 2009 Woodbine, a four-piece bluegrass band from Co. Kildare, Ireland, opened a special concert in the Great Hall at the Northern Ireland Parliament Buildings, Stormont, near Belfast, before an invited audience of some 250 people from Northern Ireland and abroad. 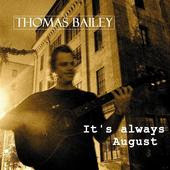 In August 2008 William Hay, Speaker of the NI Legislative Assembly, formed the idea of a St Patrick's Day concert to celebrate the rich diversity of music, song, and the bardic traditions in Ulster and the rest of Ireland. The show was organised by Frank Galligan, writer and radio/TV presenter, who also acts as bluegrass MC for the festivals at Omagh, Longford, and this year Athy. Headlining the two-hour concert were the dynamic young west Ulster group Kintra, who combine Scottish and Irish piping, fiddling, and dance traditions with drums, keyboard, electric guitar, and bass. The bardic tradition was represented by Declan Forde, storyteller and reciter of 'poems with chords'. The audience responded with two standing ovations at the end of the concert, and Woodbine were not allowed to leave without playing for a further thirty or forty minutes in the Stormont bar. The concert reaffirmed links between communities in Ulster, Ireland, and abroad, and Frank Galligan summed up the evening as 'a night to remember, and most definitely a great advert for bluegrass music and the traditions from which it stems'. A fuller report is here. The alt.country singer/songwriter Lyle Lovett is currently touring in Europe with his Acoustic Group; having played in the UK this week, they will be playing the following dates till the end of the month. Lilly Drumeva and her band Lilly of the West continued a busy spring schedule with shows at the Tea House, Sofia, Bulgaria on St Patrick’s day, 17 March 2009, and the following day on SKAT TV. For both concerts they were joined by special guests from the Czech Republic: mandolin virtuoso Radim Zenkl, who has been living in California for twenty years, and a longtime friend, master banjoist Lubos Malina. Both have a passion for Bulgarian folk music and its instruments, such as the kaval flute. The band - Lilly (guitar), Yasen Vassilev (guitar), Ivan Penchev (fiddle), Borislav Bojadjiev (percussion) - and their two guests presented a mixture of bluegrass, country, Irish, and Bulgarian folk music. Highlights included two Bulgarian songs in unusual rhythms (7/8 and 11/16). The musicians are planning a repertoire of bluegrass with Bulgarian rhythms. A fuller report with photos is here. 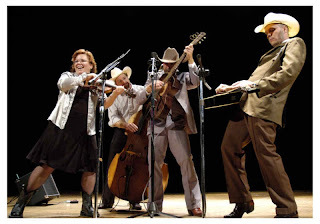 The Spring 2009 edition of British Bluegrass News, published by the British Bluegrass Music Association (BBMA), will include a cover story on the Thunderbridge Bluegrass Boys (left) from the West Country, and feature stories about the Home Counties band Papa Truck, the Midnight Ramblers, and Laurie Lewis, the last two of whom are scheduled to do separate tours of the UK. Greg Cahill, whose Special Consensus toured Ireland and the UK early this year, contributes a guest article. Also in this issue: Rick Townend’s tribute to Bill Clifton; 'May is Worldwide Bluegrass Music Month'; ‘Favourites’ chosen by the Carrivick Sisters; and 'The story behind the song', about Carter Stanley’s ‘The white dove’. All this, plus the usual 'What’s on', tour details and 2009 festival dates, CD reviews, and area reports will be in this bumper edition. The BBMA website is being made more user-friendly and updated, a task which should be completed by Easter. The full text of a press release by Richard F. Thompson is here. For further info, contact: Richard F. Thompson, Press Relations, 14 Lime Grove, Lichfield, Staffordshire, England, WS13 6ER. ‘Phone +44 (0)1543 252683; e-mail. To join the BBMA, contact Trish Hockley, Membership Secretary, Freepost, BBMA. ‘Phone +44 (0)7889 607612; e-mail. 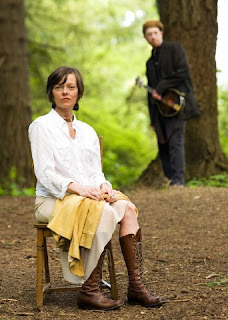 The European Bluegrass Blog mentioned in September 2008 the surgery which banjo-player and 'Father of Newgrass' Eddie Adcock was then undergoing to enable him to continue playing. Thanks to Richard Thompson on the original Bluegrass Blog for the news that an eight- or nine-minute interview with Eddie by Jonathan Groubert can be heard online on Radio Netherlands Worldwide. The interview focuses on the illness, which affected Eddie for fifteen years before surgery, and on the difference made by the treatment. Memories of his experiences with the Country Gentlemen are also shared. The IBMA is pleased to announce the graduating class of Leadership Bluegrass 2009, pictured here at BMI in Nashville on 12 March (photo by Priscilla Warnock). Row 4: Alan Tompkins, Dwight Worden, Tommy Sivert, C. Roger Moss, Danny Clark, David Preston. Leadership Bluegrass, now in its tenth year with more than 225 alumni, is an intensive three-day program of advanced-level, interactive learning experiences that invites participants to examine the challenges and opportunities facing our music along with related leadership issues. Leadership Bluegrass 2009 was hosted 10-12 March at BMI in Nashville, TN, and was facilitated again by Fred Bartenstein, a noted bluegrass historian and professional meeting facilitator. The Facebook group of EBMA has as of today exactly 100 members. And this is the link. It's limited to Facebook users, but then again it's free worldwide. As announced on the European Bluegrass Blog on 18 February, Lilly of the West performed the first bluegrass concert at the Bulgarian Cultural Centre, in the heart of Prague (CZ). The many distinguished guests - including the EWOBA president, Dennis Schut (NL), and Ruth Gruber (US), journalist for the Herald Tribune - were greeted in fluent Czech by the director of the Bulgarian Cultural Centre, Boyan Panchev. Lilly’s band featured Jasen Vassilev (BG) on guitar, Svoboda Bozduganova (BG) on upright bass, and special guests from the Czech Republic: Jarda Jahoda (banjo) and Zdenek Jahoda (mandolin). They performed two sets, with a mix of modern bluegrass, country, swing, and jazz standards. During the interval Petr Hruby (CZ) and his band All Bells & Whistles took the stage for five songs, supported by Jiri Kralik (CZ) on fiddle. For an encore Lilly of the West performed some famous Bulgarian folk songs for the Bulgarians in the audience. A full account with more photos can be seen here. The Bluegrass Masterclass Workshop on 11-12 April (see the EBB post of 31 January) with Jim Hurst (guitar), Byron Berline (fiddlle, mandoline) and Alan Munde (banjo), at La Grange Rouge, near Macon. The FBMA Spring Weekend meeting (29 May-1 June) in the Leisure Centre at Mézière sur Couesnon (Ille et Vilaine), Britanny; for more info e-mail Philippe Chapuis. The annual Grange Rouge Bluegrass and French Folk Weekend, held as usual on the second weekend in June (13-14 June 2009) for anyone who happens to be in the area; bands play 30-minute sets; sleeping in hostel conditions. For more info on both Grange Rouge events, e-mail. The La Roche Bluegrass Festival (30 July-2 August), La Roche-sur-Foron, Haute Savoie, features the EWOBA Band Contest with twelve bands from six countries; a further sixteen bands from Europe will also perform, along with Carrie Hassler & Hard Rain (USA), Sally & Chris Jones (USA), Bob Jones (USA; ex Blue Grass Boy) & Bononia Grass (I), Monogram (CZ), Acousticure (H), and Philippe Naudot (F) & Vodopad (Sk). The full programme can be seen here or downloaded from the La Roche website. I just finished a new album with the band you saw in Longford: new tunes and some covers. Lluís Gómez & Joan Pau Cumellas: Barcelona Bluegrass Band will be available at the end of May. Tim Carter is going to mix and record a twin banjo, also J.P. and me are playing as a duet. Al Ras change date: 7 November 2009 Mollet del Valles, at the old theater called Mercat Vell - still working on the line-up. Last Feb. I booked a gig for Tony Trischka in Santander, in a very nice theater; all the audience was excited listening to Tony's tunes. For some people their first time listening to bluegrass was that very night. He invited me to play two tunes; it was great! The city authorities have decided to hold Dobrofest every other year; so resonator guitar enthusiasts can hope for the next event to take place in 2010. The report on the Summit has been finalised and is now available online - along with all related documents - on the EBMA website at EBS 2009. There, you will also find a button directing to a new externally hosted section, the EBS Google site. It's a nice tool to be able to save information and for designated people (with a Google account) to add documents and/or comments on various issues. This site is still being developed but it sure is a good start. Any comments are welcome. Thurs. 7 May: Jicin, Czech Republic, 8.00 p.m.
Intervening dates are available: contact A.R.T. Promotions. This is the last European tour of a bluegrass band which A.R.T. will be coordinating. Rachel Harrington (USA), singer and songwriter from a Pentecostal small-town Oregon background, has won glowing reviews for her debut album The bootlegger's daughter (2007) and her latest, City of refuge, which features Tim O'Brien (fiddle), Mike Grigoni (dobro), Zak Borden (mandolin), and Jon Hamar (upright bass), with Holly O'Reilly and Pieta Brown on backing vocals. She is now due to begin a three-month tour, sponsored by Maverick magazine, of the UK, the Netherlands, and Belgium, with multi-instrumentalist Zak Borden accompanying her. The first appearance will be on air with Bob Harris on 7 April, after which the duo will be playing sixteen dates in England and eight in Scotland before crossing to play four shows in the Netherlands and two in Belgium (28 May-2 June), finishing with a further sixteen dates in England and one in Wales. Full details are on the 'Shows' page of her website. Johnny Butten, the English banjo-player now resident in the USA who holds the Guinness Book of Records title of Fastest Banjo Player in the World, has launched an appeal on Banjo Hangout. Johnny approached Don Bryant of North Carolina to build a banjo neck for him, and found that Don's son Josh Bryant had suffered grave injuries in a car crash, and was hospitalised with major complications. In consequence, Johnny and his wife Sammy are heading a campaign to rally support for Josh and the Bryant family, including sending cards, letters, and other tangible support such as CDs and promo material. Johnny will also be raising funds by means of a sponsored 'endurance pick', and is planning a benefit concert. Full details can be seen here. Johnny and Sammy Butten can be contacted by 'phone (+1-218-962-3229) or e-mail. 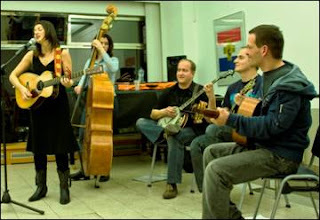 Thanks to Lluís Gómez for news of the Barcelona Bluegrass & Old-Time website, a valuable service to anyone living in the area or visiting the city. Our aims have not changed and we still endeavor to promote Bluegrass by putting on events & sessions throughout the year & hope that this website will be used by Bluegrass/ Americana lovers all over the world. The website also gives information on Guitarland (C/Diluvi 6, +34 93 2188677), the only shop for bluegrass instruments in Barcelona, and on the 8th Al Ras Bluegrass & Old-Time Music Festival, which will be held on 7 November 2009 at Mollet del Valles, Mercat Vell. Details of the lineup are on the Festival's MySpace site. Thanks to Charles Dumont for news of a new application that is available for the iPhone: a collection of 700 banjo chords in open G tuning, for only $1.99. Chords in other tunings are said to be in preparation. Dagfinn Pedersen reports that the celebrated audition scene from O brother, where art thou? has been reinvented by the Norwegian band Ila Auto. It can be viewed either at the first video link on the Norwegian Bluegrass Music Association website, or here. The International Bluegrass Music Museum at Owensboro, Kentucky, will hold its Fourth Annual Monroe-style Mandolin Camp on 11-13 September 2009. A maximum of fifty students will be able to take part. The teachers (who will give a combined concert on the Saturday night) will be Mike Compton, camp & curriculum director; Dr Richard Brown, associate director; Skip Gorman; Tim O'Brien; Jody Stecher; and Butch Waller. Special guests: Tom Ewing, Monroe historian and concert performer, and Will Kimble, luthier. One-to-one master classes will be part of the programme. The Monroe-Style Mandolin Camp is the ultimate gathering spot for Monroe enthusiasts. Satisfy your desire to 'Know Monroe' by spending the anniversary of his birth and passing at the museum and the camp dedicated to preserving his legacy. Last night I dedicated the first hour of my show to European bluegrass. After the Summit meeting in Bühl, I had some CDs from you which I meant to play since then (see playlist attached). I received also others in the post recently. Thank you for sending them. If you'd like a CD copy of the show, let me know. I'll gladly send it to you. The 'Country with Lilly' playlist for 6 March 2009 can be seen here. We believe Old Time should have a presence at Sore Fingers Week as it is inherently linked to the music we seek to promote, so we are not discontinuing the availability of Old Time courses. We will make contact with a fiddle and banjo tutor from the US for 2010, but these will only be confirmed if we get a minimum of fifteen booking by the end of August 2009. If we don’t achieve those numbers, we will replace the US tutor with one based in the UK to keep the costs down. US people being considered are Bob Carlin, Dirk Powell (if we can get him), Bruce Molsky, etc. More news on this later. UK tutors under consideration are Dave Marshall, Bill Whelan, Jock Tildesley, Dave Proctor, Kate Lissauer, etc. Please note Jock will be teaching the Old Time course next October. If anyone has any comments or suggestions, please feel free to contact us at the Sore Fingers Week office. Anyone interested in old-time music and its roots in the British Isles will welcome 'Going Across the Sea', which brings together seven fine musicians from both sides of the Atlantic to celebrate and explore their common ground. Kris Drever and Sarah McFadyen from Orkney, Eamonn Coyne from Ireland, Tim Matthew from Scotland, and from the USA Betse Ellis of the Wilders and Caleb Klauder and Sammy Lind of the Foghorn String Band will be playing thirteen dates together in Scotland and the Islands from 22 April to 6 May. More details are here and on the Folk Radio UK website. May 2-9: Old-Time Music Week with Dave and Tim Bing is now fully booked. May 10-17: Old-Time Music Week with Dave and Tim Bing has space for a few more participants. Focus on banjo, fiddle and guitar technique, repertoire and ensemble playing. Other instruments welcome. Oct. 3-10: Old-Time Music Week with Beverly Smith and Carl Jones has space for several more participants. Focus on mandolin, fiddle, guitar, singing, and writing tunes and songs. All instruments welcome. For more information on all camps, see Kate Lissauer's website. 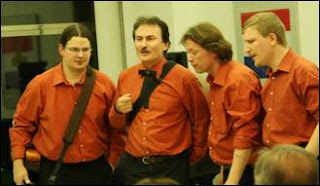 The 4th Winter Bluegrass Workshop took place from 27 February to 1 March 2009 with the Petr Brandejs Band and other top Czech and Slovak instrumentalists. Sixty-seven students and eight teachers spent the pleasant weekend in northern Moravia (Novy Jicin). The Saturday show included all the instructors plus Martin and Zuzanka Brandejs joining their forces with PBB (above). Planning a European tour? Do you have a European festival booking and are you looking for some more follow on gigs? Do you have a gig offer in Europe and are you looking to build up a tour? If you are acting as your own agent and organising your own tour you can put your dates forward to me with a request for enquiries to be routed to your e-mail / telephone number etc. This will be placed on the On Line Notice Board. This can be accessed from a button on the EBMA site, and more links are being established with bluegrass promoters, European Music Festivals, and European National Bluegrass Associations. What I am looking for is a fairly concise notice about your tour with links to your own site. You can put this notice forward to me as your own representation, or if you have an agent/manager I'm happy to accept information from your representative. The Orwell Bluegrass Festival will be held from Friday 24 April to Sunday 26 April at Hallow Tree Camp Site, Ipswich, Suffolk, England. Bands playing include Chill Until Blue, Chris Moreton, Home Territory, the Hope Mountain Band, Kitty Hawks, Longway, Monroe's Revenge, the New Essex Bluegrass Band (veterans of many appearances at the EWOB Festival at Voorthuizen, NL), and the Thunderbridge Bluegrass Boys. Hello EBMA. We are 40 minutes from Stansted airport. With the current exchange rate, it makes it worth the trip. A great line up of bands - we would love to see you there. The Camp was attended by twenty-two keen banjo devotees in the end; we only should have had twenty, but bad math on my part... We also had a waiting list of seventeen people waiting in the wings. The Camp itself was a outstanding success. John Dowling is not only a master of playing the banjo but the master of teaching the banjo; I think everyone involved benefited from his patience and skill as a tutor. The Broken String Band entertained us - the students plus invited guests made up of friends and family and those who unfortunately we could not accommodate this time round. It is safe to say that - all things being equal - we will be running Dangem Banjo Camp 2010. For a taste of the atmosphere at the Camp, see 'Duelling Banjo' played by John Dowling and the Broken String Band on YouTube. I have established an online Notice Board of forthcoming European tours, as a follow-up from the European Summit. The ad hoc group working within EBMA to advance Continent-wide booking issues consists of John Sheldon (convener), Christopher Howard-Williams, Chris Keenan, Dagfinn Pedersen, and Rienk Janssen. Please feel free to publicise the existence of this Notice Board and send me details and notices for inclusion on this board. I will paste your notices online for you and keep this updated according to the information you supply me. This is a simple means to publicise to other promoters and interested parties the tours you are planning within Europe. The Notice Board will allow other interested promoters to network with you and follow up any requests you make or information you place on the board. I will include any information you send me on this notice board relating to forthcoming European tours. Contact John Sheldon by e-mail. Bands now listed on the Notice Board (with links to band websites where available) include White Mountain Bluegrass, Randy Waller & the Country Gentlemen, the Midnight Ramblers, Wayne Taylor & Appaloosa, the Chapmans, Remington Ryde, the Smith-O'Reilly Bluegrass Band, and Craig Duncan & Friends. Following on the European Bluegrass Blog's post of 10 February, which listed his gigs for March and April, Italian guitarist Roberto dalla Vecchia reports that his Acoustic Guitar Workshop will take place from 30 May to 2 June 2009 at Recoaro Mille, in Vicenza, Italy, beginning at 11:00 on 30 May. Full details are on Roberto's website. The New Acoustic Gallery's 2009 concert season begins with a recital by the classical guitar virtuoso Ana Vidovic in the Gallery at 19:00 on Sunday 8 March - a great opportunity to see this world-class artist in live performance. Now living in New York, Ana Vidovic was at 13 the youngest female student in the Zagreb Musical Academy, where she studied with Prof. Istvan Romer. Her excellent record in Europe earned her an invitation to study at the Peabody Conservatory of Music in Baltimore (USA) with Manuel Barrueco. Videos can be seen on YouTube. Tickets (VV: 30/AK: €35) can be booked by telephone at +49 0212/2474007. Blue Highway (USA) are celebrating their fifteenth year together: the band originally formed on 31 December 1994, with the same personnel as they have now. Many other photos by Lilly - including the one on the right, taken in 1998 at the Dobrofest, Trnava, Slovakia - appear in Blue Highways' 15th anniversary photo album on their website, to which they will be adding all through 2009.